As of last night around 11:00 pm, the team finished up our final demo of From Sea to Shining Sea. It’s a little bittersweet to wrap up this project. We all became really invested in the development of the game, and we wish that we could have seen it through a little further. However, we are all very proud of what we have been able to accomplish in the time we had. The group really enjoyed going through the development process together and learning to navigate the different pitfalls we encountered. The whole process has made us think about the medium of video games in an entirely new way. When we began initially planning out the concept for our game, we were not looking for an exact story that we wanted to tell. We wanted to communicate a personal experience to the player. We realized that the medium allows us to create something that goes beyond the observation of an experience. We could make the player participate directly in that experience. Although we found this to be a challenge, we ultimately feel that we were successful, but understanding the process that goes into creating an immersive and historically engaging virtual experience was eye opening to say the least. Both the sheer volume of work that had to be done and the diversity of tasks seemed daunting. The combination of historical research and analysis combined with the creativity and literary skill needed to flesh out the game provided for some interesting challenges in how we could reconcile our creative urges while maintaining our desired degree of historical accuracy. However, perhaps this creative engagement with history in and of itself is a valid historical process. The ideas and fears that From Sea to Shining Sea interacts with were real and tangible things that people had to deal with in their daily lives. Perhaps this creative retelling and imagining of those fears is itself a compelling and useful way to tell history. The past few weeks have been a blast, and I won’t forget them anytime soon. I hope that you enjoy our game, and that you find it thought provoking. The game is meant to make you think. Let it. Consider the themes that are presented and take them to heart. Thank you so much! This is Luke Hussung from The Sea to Shining Sea Squad signing off. Other members of the team are planning to write their own goodbyes in the comments of this post. Be sure to read theirs as well! Speaking for my team members, I know we all have enjoyed our first year Centre term class. The freedom that was given to us to create freely was a blast. We all gained valuable skills in group work that will help us in future classes as well as our careers in the future. We want to think the class for providing a space that we could freely create without judgment, because we all know how are game could have offended someone. The creation of our game will be something the five of us share for our time at Centre. We would also like to say how grateful we are to have had the experience to research our own ideas when creating this game. We were not given a restriction to what we had to create. We were given the burden of freedom to make our own choices when it came to our video game. We were allowed to use our interest to create something we thought would be fun for people to experience. All of the groups were allowed to do this. It shows in the final products of our games how not one single game was the same. Some focused on more of a linear story, others gave the freedom of choice. All three of our games have strengths and weaknesses that possibly with more time could have been turned into really good products. I know that the experiences I have had in this class will stick with me for my time at Centre. All the lessons that we were taught and have learned will help every single one of us in a different way. Not everyone will take the same lessons as everyone else due to us all having different interest, but I am sure we all have taken away something from the class. Just as we all have taken away something from this class, we have all given something to the class. We all have had different thoughts on research that maybe the whole group has not thought of. In all the uniqueness of the group we had provided different insights on all of our research. The individual presentations have also given us the ability to see a different perspective on an issue that we all thought would have been simple, but we turned into a complex idea. With all history, we have learned that it is always complicated. Thank you all for the joy that this class has brought. As the end of CentreTerm approaches us, we had our game demo today in class. We got the chance to check out the other group’s game. We also got the chance to show everyone else in the class our game that we have been working on for a while. We also got our part in the group presentation assigned tonight, so that we were prepared for the presentation tomorrow. We had fun testing out the other groups games today in class. I really enjoyed how each group made a good game out of twine. The reason our group didn’t pick twine as a software for our game was because we thought it would be boring to play. It turned out to be really fun to play both of the groups games. The idea of just reading words and making choices seemed boring to me, but it turned out to be fun. Our group also had to show other group members how to play our game when they got to our station. We explained most of the dialogue and how the goal of the game relates to the dialogue. After we explained how to play the game, people seemed to like the game and how it played out. My guess is that we had used RPG maker for the software of our game, and was the only group to do it so everyone wanted to see how it turned out. For the most part though, I thought game demo day was a good day to see how our game would do in the fun compartment. 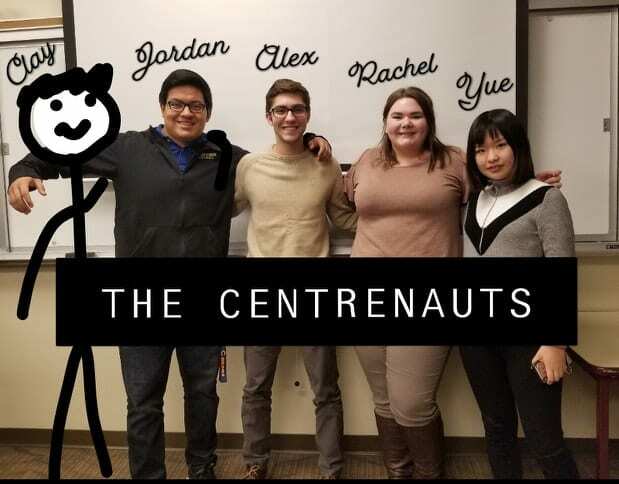 All in all, the Centrenauts had a successful day today. After trying every game out as everyone knows, we played smash bros and had a blast. The From Sea to Shining Sea Squad has been hard at work for the past three weeks in order to create a fun, interesting game based on the Cold War. We’ve been working almost nonstop for our last few days in order to make our portfolio and our final product of our video game. Who needs sleep when you’re a video game developer? We met for an 2 hours after class and then 2 more later in the day to finish the game and put some finishing touches on our portfolio. We felt like it was super important to make the portfolio as good as we could possible make it while also maintaining the focus on our game. We also, despite not being able to finish all of what we wanted to finish for the game, gave it our best effort to bring the game to an ending spot that we were proud of. If anyone tells you that it’s easy to make a game in three weeks, they’re lying! However, it’s still tons of fun! Today in class was Demo Day where we got to display our game to the others and vice versa. This had me and, I think, the rest of my group pretty nervous. It’s a little scary putting so much time and effort into something and then finally have people get to play through the game. It was really exciting getting to see everyone enjoying our game as well as being able to enjoy other groups’ games. I know Luke and I were a little apprehensive about putting so much detail and visualization into the game since we were the ones in charge of making the game. However, it seems like that was a high point about our game in other people’s opinions. It was interesting seeing how everyone in the class decided to create their games based in the 20th century and seeing how each group brought that to life through Twine and RPG Maker. Though we were faced with a few challenges throughout our process like keeping our game historically accurate while still focusing on our counterfactual, we had so many successes that are worth highlighting. We all got along really well and right from the beginning had a clear idea of what we wanted to focus on when creating this game and really the pieces just started to fall into place. We all had a good idea of what each of us wanted to focus on throughout the process of making the game and the portfolio and we were able to get it done in a relatively short amount of time. We found researching to be and easy and constant process. (We were literally researching until yesterday.) However, this did make for our best possible version of From Sea to Shining Sea. I think I’m justified in saying that all of us had a blast making this game and are really proud of it. Fun Fact #1: From Sea to Shining Sea came about kinda on a whim and ended up fitting our game really well as the protagonist is from California and is forced to travel to Washington D.C., from west coast to east coast. It’s also pretty ironic which is fitting for the humor of our group. Our game is touches on the idea of cruel and unusual punishment and the “witch hunt” of McCarthyism. From Sea to Shining Sea is a lyric from an American patriotic song about freedom thus creating some irony with our title and our game. Fun Fact #2: Throughout the game, the protagonist encounters many different people as they go through their journey in this “post-apocalyptic” counterfactual. Some of the characters’ names are a reference to each of the developers’ names. It’s a little silly and we thought of it kind of last minute but we thought it was a fun easter egg to have stuck in there. As we go into the final days of our Centre term class, we are wrapping up our portfolio and have completed a final version of our game Nazi Germany: The Survival of Günter Schmidt. We met after class today for about an hour to put the final touches on our presentation tomorrow and for our portfolio. We plan on meeting again tonight to practice our presentation as a group as well as discuss how we will showcase our game in the presentation. Today in class, we had a Demo Day where each group’s games were on display for the other groups to play. I enjoyed seeing the work other groups put into their game and how it translated into a functional play-through game. It was also cool to watch people play the game that my group made and observe the pathways through the game that each player took. The original time settings of each of the games made were all relatively close ranging from right before World War II to a few decades after. While we played their games, we also were able to discuss what they were intending to create for a certain portion of the game and how it translated digitally. The RPG maker game was the only one in the class that did not use Twine so was interested in playing the game with a different software than my group. To my surprise, the game was still a very dialogue heavy and text based game. I discussed why with one of the team members and we agreed that for all of the games, we did not have the capability to create videos as a backstory, instead we had to set a basis for the game in text. Despite using different softwares that changed the gameplay experience dramatically, we still faced some similar challenges. Today was our second to last day of class. This Centre term inside the classroom and out has been very enjoyable. My group along with the class has established a new understanding for the appreciation for the video games that we play on a weekly basis. We have also met a new group of people that enjoy similar hobbies and have established friendships around that commonality. The group work experience that we gained during this multiple week long task has benefitted us all with working as a team. The multiple presentations also allowed us to gain some comfort with public speaking. I along with my team members have enjoyed this class and look forward to the finale of our video game tournament tomorrow! It is almost the end of Centre Term. Our video game production is coming to an end with our final demo to be displayed tomorrow. Throughout this whole term, I have been responsible for thinking of other video games that could impact our’s. So I’m here today to talk about a type of mechanic in a few video games that led me to use them in our game. The mechanic, I call it, is Chain Dialogue. Chain Dialogue is when the user interacts with an FPC who will display lines of dialogue as a response. Usually there are two or more options to choose from. Depending on which answer, the conversation or interaction can so good or bad. Each specific choice will have a great impact later on in the story. The two main games I referenced for this were Kindergarten and Call of Duty: Black Ops 2. Kindergarten is a PC game where you’re a child at a school trying to solve a mystery. Each little student has a quest to do. Interacting through dialogue is the only option so it has to be read carefully. Usually if a wrong answer is chosen, the FPC will say an excuse and try to give you another chance. A youtuber by the name of Ohmwrecker does the series for this game on Youtube and its quite entertaining. Black Ops two has the more personal choice options of dialogue. In Kindergarten, if the wrong path is taken, the game will possibly need a restart. In the Black Ops 2 Campaign, you have many times during the story where a decision has to be made. This decision will affect the future outcome of the story, but won’t restart the game. Basically the main difference is Kindergarten has one single outcome while Black Ops 2 has multiple endings. I loved using these games a references because I went back and watched vide0s on the games. Overall the project was fun to work on with my group. I met some new people and made some memories this Centre Term. Cant wait for future ones to come. This will be my last blog post as a member of Team Decision Makers as we are winding down Centre Term, so I will be recapping the work put into our game and portfolio today. Because we were given more time to work on the final touches of our game, we all decided to run over the library as quickly as possible so that we could get a quiet workspace along with some other factors. I personally needed to reassure myself that I had used the correct pages in the books I was using for sources, as well as get my groups approval that I had cited those novels correctly in my section of the portfolio. Fisher had to work on adding a couple more words to expand upon his topic of reference games. We also explored the internet for a decent amount of time wondering how to cite video games and if that was even possible. (It is.) Edward Lee and Kaden worked on adding the home screen to Twine, which took videos on videos to teach us how. Will was dying from a stomach bug. Our main focus coming out of this past weekend as a group was to focus on the portfolio. Today, we all finished our individual parts. The only thing we really have to do on the writing portion at this point is critique one anothers so we can have a strong, well put together group portfolio. We finished the concluding comments the day before yesterday as a group, and left all other 5 pieces of the portfolio for individual work. We should have the portfolio pieced completely together with every section read carefully by our group members by tomorrow, so that it is ready to submit. Edward Lee has been running the creation of Twine on his computer for the entirety of this class, so we needed to figure out how to plug in a home screen, as asked of us. Every video game has some sort of loading screen where you can click “play” or other options with some sort of background photo or video that is relevant to the game. Although it may have taken a lengthy amount of time, Kaden and Edward Lee helped one another by tinkering with Twine after watching several educational videos, which finally resulted in our loading screen. We also are thinking about throwing in one last hidden picture within the game within the next day, possibly for taking the least popular pathway. However, before we show everyone or have them locked into our game, we need to verify with Prof. Harney that we can use these photos in our game legally. We are very excited as a group for the next two days as we finally get to show off all the hard work that went into making our game. Tonight and tomorrow night we will be getting together as a group to practice our presentation, and have each person present their section by themselves, then we will all come up and try to nail that twenty five minute mark. Thank you everyone for following along through this journey, the final product comes soon! Cannot wait for you guys to see and play it!